One theory of regulation argues that regulations arise to deal with problems associated with new technologies. Or, in some cases, regulations are eliminated when new technologies obviate their necessity. One example related to driverless cars is currently developing. The National Highway Traffic Safety Administration (NHTSA) announced that, in addition to treating Google’s self-driving system as a “driver” for purposes of interpreting existing regulations, NHTSA will also examine whether some other safety regulations, such as the requirement of a foot-activated brake system, are necessary or may even undermine the safe operation of driverless cars. The advent of new technologies, however, is not always the impetus for the creation of regulations. The over three decades of US regulatory history contained in RegData allow us to examine the history of some types of regulations. For example, we can track how a set of agencies that produce regulations on a particular subject have changed over time. Homeland security regulations emanate largely from the Department of Homeland Security (DHS) now, but rules related to the topic existed before the creation of DHS in 2003. The tough part in piecing together the history of those rules before 2003, however, is knowing which agencies to look at for homeland security–related rules. But sometimes it is easy to create a panel data series of all the relevant agencies over time for a type of rule—if that type of rule can be easily identified with a text search. For example, all regulations related to credit cards probably include the term “credit card.” It’s unambiguous, and it’s unlikely to be used in cases where the regulations are not related to the topic. 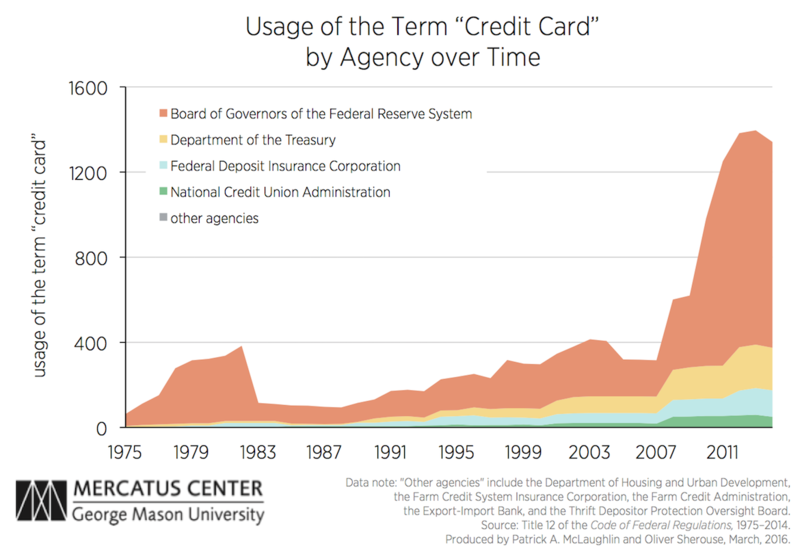 To see the history of credit card rules, then, we ran a search over Title 12 of the Code of Federal Regulations from 1975 to 2014 for the frequency of the term “credit card” in each year. Title 12 is traditionally the title where banking-related regulations are published. We depict our results graphically below, with the total number of occurrences of the term broken down by agency. Two things stand out. First, the history of regulating credit cards predates our data set. There were rules already on the books when RegData coverage begins in 1975. Second, most credit card–related regulations are very recent. A surge in the frequency of the term began in 2008, and really accelerated after 2010. Two acts of Congress may explain this: the Credit CARD Act of 2009, and the Dodd-Frank Wall Street Reform and Consumer Protection Act of 2010. It would require a bit more digging to discover the exact origins of the recent surge, which someone could do by tying the restriction data series to the Public Law Database, which associates regulatory restrictions with their statutory authorities, and then examining why those statutes were created. The Public Law Database is part of the RegData 2.2 package, available for download here. But it is interesting to note that even a simple glance at the empirical evidence brings into question the theory that regulations are created because of new technologies. Credit cards, in some form or another, have been around for at least 50 years. On the other hand, the usage of credit cards has proliferated over this time period, and the features of credit cards themselves have evolved. * The recent surge may reflect a response to either the evolution of the size of the credit card market, or the features of credit cards themselves. * For a fascinating and detailed history of credit cards, see Todd J. Zywicki, “Consumer Credit and the Payments System: Evolution of the Credit Card,” in Consumer Credit and the American Economy, eds. Thomas A. Durkin, Gregory A. Uiehausen, Michael E. Staten, and Todd J. Zywicki (Oxford University Press, 2014).